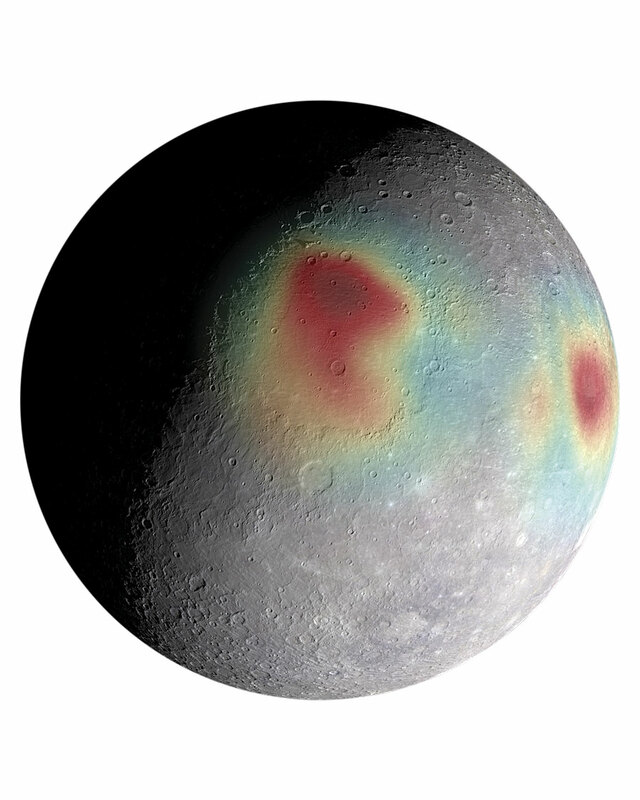 A shape model shows Mercury's gravity anomalies, which indicate by color the planet's subsurface structure and evolution. Image credit: NASA/Johns Hopkins University Applied Physics Laboratory/Carnegie Institution of Washington. In 2015, NASA’s MErcury Surface, Space ENvironment, GEochemistry, and Ranging (MESSENGER) spacecraft, the first probe to orbit Mercury, ended its 11-year mission by slamming into the surface of the solar system’s innermost planet. Before its violent demise, MESSENGER sent imagery back that, coupled with imagery from the Mariner 10 flybys in 1974–75, has enabled the mapping of 100 percent of the planet’s surface, with 98 percent of it at a resolution of 1 kilometer or better. Mercury is the least explored of the terrestrial planets. Mapping its surface will help scientists learn more not only about its formation and geologic history but also about that of the other terrestrial planets. ArcGIS for Desktop and its extensions play a central role in managing and transforming photogeological and topographic data into maps. Planetary geologist Paul K. Byrne, assistant professor of planetary geology at North Carolina State University and a MESSENGER visiting investigator, explained to Esri writer Matthew DeMeritt how mapping helped to interpret the remote-sensing data collected by MESSENGER and how GIS enhances investigation of the solar system. DeMeritt: How did you end up becoming involved with the MESSENGER mission, and did your GIS background help you become a visiting investigator? Was GIS part of the mission from the outset? Byrne: I was very fortunate to join the MESSENGER team as a postdoctoral fellow, based at the Carnegie Institution for Science’s Department of Terrestrial Magnetism, in Washington, DC. I applied for the position shortly after finishing my PhD, in which I studied the evolution of giant volcanoes on Mars using GIS techniques to map landforms on their flanks. 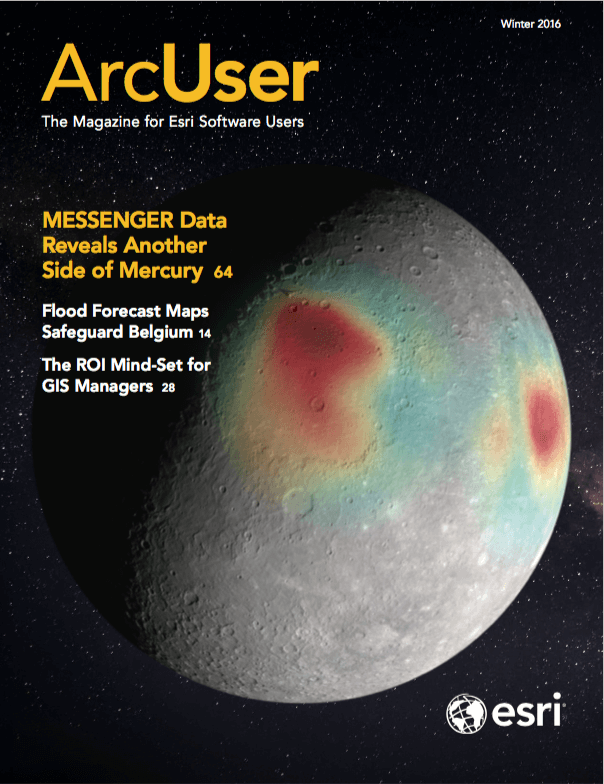 My experience with Esri ArcGIS and the use of two- and three-dimensional image and topographic data was definitely a boon to my getting hired by the MESSENGER team because I had the training and background to combine the types of data we were going to get of Mercury. From the start, the mission placed a large focus on using GIS to analyze and make sense of what we were seeing on Mercury. All the data we downlink were, after some processing, made GIS ready, and so it was a fairly straightforward task to drop it into ArcMap and get mapping! 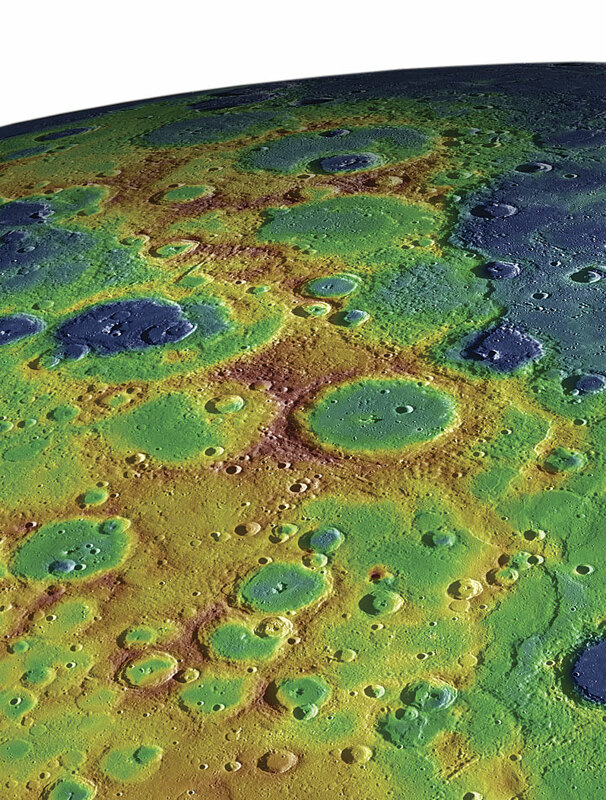 Mercury's surface with elevations color-coded from high to low terrain. A series of cliff-like scarps along the right-hand side of the image form what scientists term a "fold and thrust belt." Image credit: NASA/Johns Hopkins University Applied Physics Laboratory/Carnegie Institution of Washington. DeMeritt: In the fall 2012 ArcNews article “Surveying Mercury” [written as MESSENGER was sending the first image data back to earth], you said that cartography was pretty much the most important way to interpret the geology of any planetary body. What are the most significant discoveries that MESSENGER has made, and how do they illuminate our models of terrestrial planet formation, if at all? Byrne: We’ve had such a successful mission with MESSENGER that it’s impossible to say which one discovery is the most important. There have been so many. For example, MESSENGER data have been used to produce maps of so-called permanently shadowed craters—craters near the poles in which sunlight literally never reaches the crater floors. 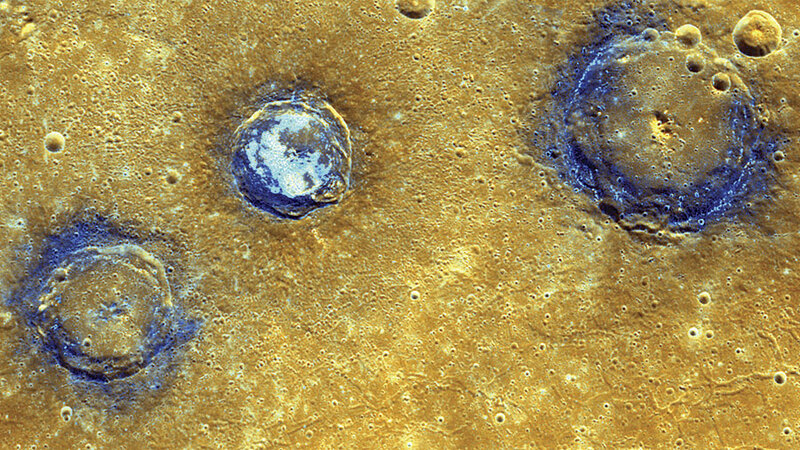 Inside many of these craters, MESSENGER spectrometer, altimeter, and image data together show that not only are there deposits of organic, volatile compounds present but also deposits of water ice. We’ve even been able to directly image some of these exposed ice deposits. That ice had been identified from radar measurements taken from Earth long before MESSENGER and had even been hypothesized to be water ice, but to confirm that hypothesis with multiple datasets was a major achievement of MESSENGER’s mission. DeMeritt: To what extent did the maps generated from Mariner 10 spacecraft—the first probe to visit Mercury—inform the mission? Byrne: We’d be remiss to ignore what Mariner 10 told us about Mercury, even if that mission was completed four decades ago. Mariner 10 only saw about one-half of Mercury’s surface in its three flybys in 1974–1975, but that half was enough to calibrate our understanding of the planet and frame the questions that MESSENGER was designed to answer. Byrne: Absolutely. The United States Geological Survey has done a wonderful job converting Mariner 10 data to a GIS-compatible format, which means we can make direct comparisons between MESSENGER and Mariner 10 data within the ArcGIS environment seamlessly. We’ve been able to start with the Mariner 10 quadrangles [slightly overlapping rectangular maps of a planetary surface established by the US Geological Survey that cover 7.5 minutes of latitude and 7.5 minutes of longitude] and compare them with imagery from MESSENGER. That comparison enabled scientists to look for geological units, landforms, and so forth, in areas that Mariner 10 didn’t see—basically the whole northern hemisphere. We did this to answer the question of whether what we saw in that one hemisphere in the 1970s is representative of the planet as a whole. It turns out that, in the main, this is the case. A map of permanently shadowed regions and radar-bright polar deposits in the northern polar region of Mercury. MESSENGER data has shown that the radar-bright deposits are composed of water ice, sometimes beneath a lag of organic material. Image credit: NASA/Johns Hopkins University Applied Physics Laboratory/Carnegie Institution of Washington. DeMeritt: The Mariner 10 flybys of Mercury in the 1970s showed what looked like buckles on the surface, seemingly indicating that it shrank over time. Was one of the objectives of MESSENGER to measure the contraction with a more detailed basemap? Byrne: Yes. One of the big questions raised by the Mariner 10 mission was, Are the cliff-like scarps we see in abundance on one-half of the planet also on the other half? Mariner 10 only observed Mercury’s southern hemisphere. Determining the amount that Mercury contracted tells us a lot about its interior structure and volcanic history. We used photogeological images to first map the lengths and characterize the distributions of these scarps across the entire surface using the Editor tools within ArcMap. We could then add topographic data to the project and use the [ArcGIS] 3D Analyst extension to determine the topographic profile of a subset of these mapped scarps. With that information, together with some basic statistical assumptions about the geometry of faults underlying these scarps, we were able to calculate the extent to which Mercury had contracted. We were pleasantly surprised when we found that Mercury has shrunk in radius by as much as 7 kilometers, which is the biggest global contraction of any terrestrial body we’ve observed in the solar system so far. With those same basemaps, the oldest parts of Mercury have been identified on the basis of the number of impact craters per a given surface area; strangely, the oldest portion of Mercury’s crust is about 4.1 billion years old, but the planet as a whole is the same age as Earth: 4.56 billion years. There’s over 400 million years of missing history on Mercury, and we’re still working to figure out why it went missing. On the other hand, it turns out that Mercury has some staggeringly young features too. MESSENGER image data have told us a lot more about strange pit-like landforms we call “hollows” appearing all over the planet. Hollows appear to be sites where something has sublimated from the planet’s surface, but just what that material is remains an open question. From our global mapping and high-resolution targeted images, we now know the distribution, sizes, shapes, and even the rates of formation of these unique landforms. In short, the image data alone from MESSENGER will keep us occupied for many years to come, at least until the European Space Agency’s BepiColombo mission reaches the planet in 2024, and probably for a long time thereafter. And given that MESSENGER is one of NASA’s Discovery-class missions—the cheapest of three mission classes—our new understanding of the innermost planet has come at a bargain price. This enhanced color mosaic shows (from left to right) Munch, Sander, and Poe craters, which lie in the northwest portion of the Caloris basin. The smooth volcanic plains that fill the Caloris basin appear orange in this image. All three craters are superposed on these volcanic plains and have excavated low-reflectance material, which appears blue in this image. Image credit: NASA/Johns Hopkins University Applied Physics Laboratory/Carnegie Institution of Washington. DeMeritt: Some laypeople might look at Mercury and not see much difference between it and our moon. Do maps of Mercury give us any insight into the larger questions about planet formation relative to location in the solar system? Byrne: The majority of Mercury’s surface is composed of solidified lavas that have been substantially reworked by subsequent asteroid impacts, whereas most of the lunar surface is made up of a material that formed very early in the moon’s development and is chemically very different from Mercury’s lavas. We can make these comparisons because we have enormous volumes of chemical data for Mercury, which we can plot into global elemental abundance maps, for instance. And from measuring the number of craters per unit area on both Mercury and the moon, we can tell that, although lavas poured onto the surface of the moon over several billion years, the resurfacing of Mercury by lavas ended globally at around the same time, almost four billion years ago. MESSENGER scientists are still working to figure out why, but it may be a result of the planet starting to cool and contract, which squeezed shut the conduits that magmas were able to exploit on their way to the surface. 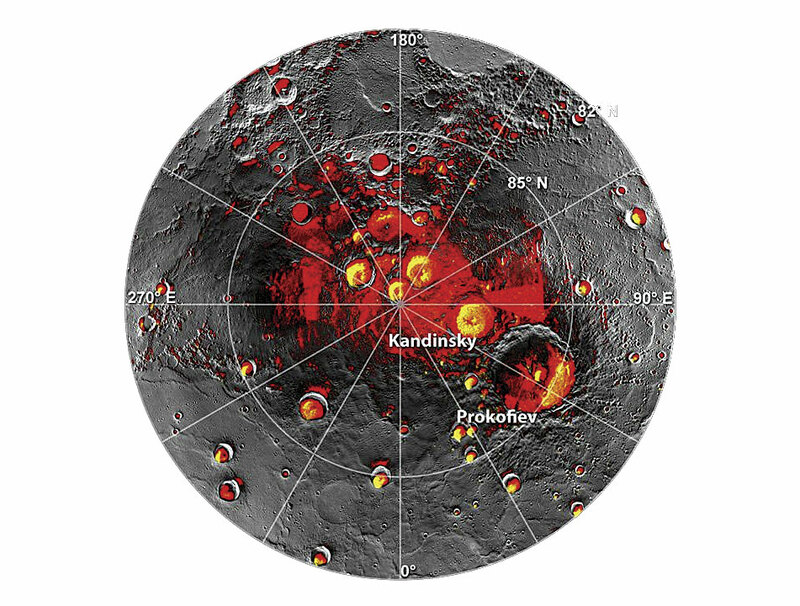 Some of the MESSENGER mission’s fundamental objectives included understanding Mercury’s geological history, the nature of volatile materials at the poles, and the composition of the planet’s surface. Integrating imagery, chemical, spectral, and geophysical data, among other types of data, has afforded us the ability to answer those questions and raise a whole host of new ones. It’s no exaggeration to say that the MESSENGER mission has been a resounding success, but it’s also a teachable moment about one of the fundamental aspects of scientific exploration: once we go out there, we’d better be prepared to go back because with every question we answer, we’ll ask two more questions. That’s as true for Mercury now as it was after we first visited it in the ’70s—we know so much about the innermost planet, but we also know we have a lot more yet to go. Since all MESSENGER data—indeed, data from all NASA missions that can be analyzed in GIS—are published in an ArcGIS-compatible format, the Spatial Analyst and 3D Analyst extensions for ArcGIS for Desktop’s ArcMap application are our go-to tools for exploring topographic data. We can also use ArcScene and even ArcGlobe to visualize subtle variations in relief, investigate relationships, or even vertically exaggerate the landscape of DEMs produced from MESSENGER imagery and altimetry data. A personal favorite of mine is to use the ArcToolbox Conversion tool to export various ArcMap layers to KML files for visualization in Google Earth. That’s a very powerful instrument for scientific analysis, conference presentation, and educational outreach. Byrne: Processing and analyzing topographic data must underpin any mission in which we gather knowledge about a planetary body’s geology, whether that’s from an orbiter, lander, or rover. Flying uncrewed aerial systems through the atmospheres of Venus or Mars, say, or remotely operating a boat on the lakes of Titan would be enhanced by high-resolution topographic data. So, my dream GIS would be a fully immersive GIS technology. Virtual reality software and hardware would enable almost fieldwork-scale investigation of planetary surfaces. That would be a major step in science education and outreach and even in preparing astronauts for on-the-ground work on the moon or Mars!